Brandy Hager has been performing in the Jonesboro, Arkansas, music scene for a number of years. She is currently working as the Brandy Hager Blues Band. She sang lead and backup vocals with Hairy Larry and The Flying Hungarians for a number of years. Brandy sang in high school choirs but got her Blues training in trial by fire when she began performces at Memphis Blues Clubs on Beale Street. An arresting vocalist Brandy can stop an audience in their tracks with one of her throaty blues numbers. 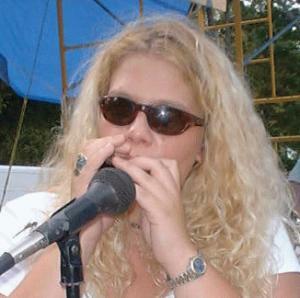 In addition to vocals she plays harmonica and percussion.